Puppies need positive reinforcement in their young lives and this starts in puppy class. Puppies arrive as blank slates but they are learning about you very quickly. Every time something good happens, puppies will want to be attentive to you. Every time something bad happens, puppies will avoid you and tune you out. Puppy Class is critical to teaching your puppy to learn through positive reinforcement. Should I Punish My Puppy? Pet Parents often ask this common question in puppy class. Most will consider punishment thinking puppies should “know better” and need to be punished to be good dogs. This is faulty thinking. 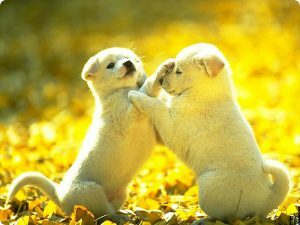 Puppies don’t know anything until they are taught. Scientific studies have proven over and over that puppies learn best through reward-based training. Knowing what the best thing TO do is more important than what to avoid doing. Do I Want My Puppy To Learn to Make Decisions? Puppies taught through a positive reinforcement puppy class become better decision makers. The perfect example is the puppy who is taught to come when called through leash corrections. Once the leash is off or the human is too far away to deliver the punishment, they feel “free” finally and run amok. Puppies taught with rewards are always free to make decisions during training and they quickly learn which behaviors get “paid”. Wags & Wiggles puppy graduates seek out attention from pet parents and distractions are easier to avoid. Why Doesn’t My Puppy Know That Biting and Jumping Is Bad? Pet parents report that jumping and biting are greatly reduced after puppy class. Most puppies behaviors we find annoying are natural to them. Imagine being scolded for just being “you”. They explore their environments through their mouths and paws, they want to jump up to smell our breath, and they want to be active. Humans have to teach their puppies that it’s more rewarding to put their mouths on toys and keep their paws on the floor. Should I Buy Puppy Classes? Puppy class is important for puppies to get out of the house to learn. They need to make friends in class, be challenged to pay attention despite distractions and get worn out. A tired puppy is a great puppy. Purchasing our 4 Pack of puppy classes gives you a great start. You could also purchase our puppy package of group puppy class plus an in-home private lesson. Puppy classes are important for pet parents to remember how to reward their puppies for good behavior. Getting a puppy is a life-altering event that can lead to moments of exhaustion and regret and maybe punishment. Pet Parents don’t want to be mean to their puppies but often don’t have the tools to know what else to do. Wags & Wiggles Certified Trainers understand and have the right tips and training techniques to make this time more enjoyable. How Do I Reward My Puppy All The Time? It is true that it is probably impossible to use 100% positive reinforcement with any puppy. Even putting a leash and collar on them is a little aversive. We do what we must to keep them safe. Counter Conditioning when introducing leash, collars, brushes, restraint, and nail trims are all part of puppy class. Since many parts of being a puppy can be a negative experience for them, your training should focus on rewarding the right behaviors. Is Positive Reinforcement Hard To Learn? Using rewards in your training is easy to do and feels natural. There are some pitfalls you want to avoid like accidentally rewarding chains of behavior that include behavior you don’t want like barking. 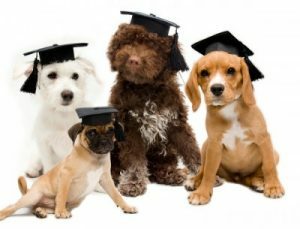 If your puppy is an Einstein learning faster than you can train, then getting professional help from Wags & Wiggles Puppy Classes is important. What If I Can’t Figure Out How To Train My Puppy? If training your puppy yourself seems overwhelming, Wags & Wiggles offers a few alternatives. Many clients find immense value in letting the professionals handle the training. Remember the cost of training your dog correctly from the start is inexpensive if you divide the cost by how long your puppy is going to live. Our newest puppy program is puppy raising. There is more to raising a puppy than just teaching sit, down and come. They need socialization with all different kinds of dogs and people. They need to learn self-control and how to make good decisions. Puppy Raising includes all this in a daycare environment with certified trainers giving lessons during the day. Potty training, naps, and lessons all included. The difference between Puppy Raising and Puppy Board & Train is whether the puppy is staying overnight at the facility or not. Board & Train is perfect for vacations. Puppy Raising is for the daily or weekly visitors. Both programs include private lessons and a group class for the pet parent. Do You Offer Discounts on Puppy Training? Our Puppy Packages give you discounts off the regular class rate. Our most popular program Training For Life is the best deal in town. You receive access to applicable classes at both locations (over 50 classes a week) for TWO ENTIRE YEARS! How Do I Figure Out Which Puppy Training Program Is Right For Me? Let Us Recommend A Program & Get A Quote. Tell us about your puppy! If you need immediate assistance, please contact the appropriate facility.